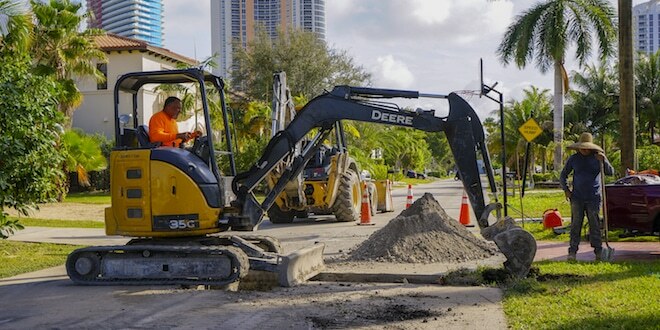 (Wednesday, January 30, 2019) – The Miami-Dade County Water & Sewer Department will be performing repairs to the sanitary sewer system within the Golden Shores neighborhood over the next several weeks. Work will involve small excavations within the roadways on portions of all the streets. Residents can expect limited access on each street as construction is done. Work hours are from 8:00 am to 4:00 pm each weekday. Miami-Dade Water & Sewer will be closing roads each day in the mornings and opening up the roads each night. Work will be completed using small equipment to limit the impacts to adjacent properties. During construction, there should be no interruption of utility services. Prior to each day of construction, the contractor will notify impacted residences via door hangers which will detail the work to be completed in your area. Residents experiencing issues with access in or out of their property should call the Project Supervisor, Orlando Valdes, 305.775.8450. Miami-Dade Water and Sewer Department 24-Hour Emergency Line 305.274.9272.